Why are interest rates so low? We have explained that the reason is the weak credit situation for financing investment. Investment is falling, as can be seen in the US in the second quarter. Carmen Reinhard provides another explanation, which I don’t know to what extent is compatible or not with this weak investment: interest rates are low because debts are high. At least this is what happened post-war, when enormous debts had to be paid back. And the only way to do this was to renegotiate and contain interest rates (financial repression), facilitating repayment. “The behavior of real (inflation-adjusted) interest rates helps clarify the role of the post-crisis monetary-policy shift. 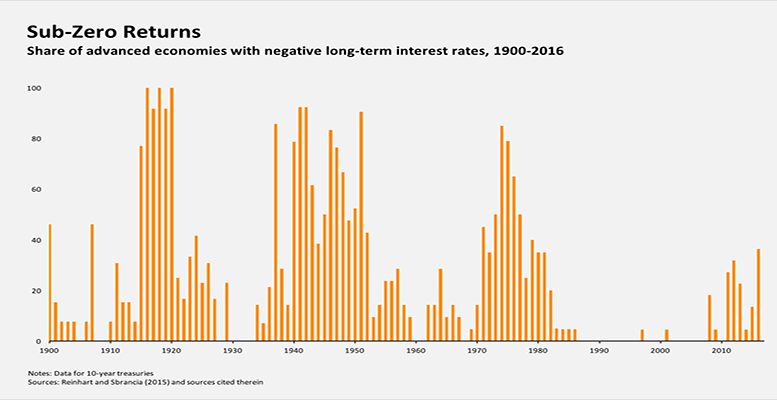 As shown in the figure below, which plots the share of advanced economies with negative long-term interest rates (ten-year treasuries yielding less than the rate of inflation) from 1900 to 2016. In the run-up to the crisis, there are no recorded negative real returns on government bonds; since the crisis, the incidence of negative returns increases and has remained high. Of course, the share of countries with negative short-term treasuries (not shown here) is even higher since 2009. “But the figure also shows that the 2010-2016 period is not the first episode of widespread negative real returns on bonds. The periods around World War I and World War II are routinely overlooked in discussions that focus on deregulation of capital markets since the 1980s. As in the past, during and after financial crises and wars, central banks increasingly resort to a form of “taxation” that helps liquidate the huge public-and private-debt overhang and eases the burden of servicing that debt. “Such policies, known as financial repression, usually involve a strong connection between the government, the central bank, and the financial sector. Today, this means consistent negative real interest rates – equivalent to an opaque tax on bondholders and on savers more generally. “So if a prolonged period of low and often negative real interest rates is not unprecedented, where is the novelty? More often than not, negative real rates were accompanied by higher inflation (as during the wars and the 1970s) than what we observe today in the advanced economies. Even when average inflation was modest (as in the 1950s and 1960s), it was still more volatile. “In the 1930s, in the midst of economic depression and sharp deflation, US Treasury bills sometimes traded at negative yields (and real returns were still positive). In today’s low-inflation or outright deflationary environment, central banks may need negative policy rates (this is the novelty part) to produce negative real rates. In the eurozone and Japan, taxing banks that hold reserves (negative-interest-rate policy) will also encourage more bank lending, and thus stimulate growth. In an era when neither haircuts nor debt renegotiating is permitted, as has happened with Greece, and without the help of an inflation spurt, this period of negative rates can last for a long time. Not that this means it’s an optimum situation, as some people claim. Macroeconomic theory is not the best analystical framework for making monetary policy decisions!